Jessica Savage of KRIS Channel 6 news reported on June 21, 2016, that “some city leaders are talking about a second round of annexation to put pressure on a controversial project in the Chapman Ranch area” citing concerns they have about the location and height of wind farm turbines, which may cause interference with area flight patterns. Flight training facilities across the nation join these city and county officials and leaders at NAS Kingsville and NAS Corpus Christi in expressing concerns about the presence of the turbines near the airfields. One such base is Travis Air Force Base, the largest Air Mobility Command base, which is located in Solano County, California. This facility, which experiences heavy traffic volume of military, private, and commercial aircraft, has been part of a lengthy research project concerning wind turbines in close proximity to flight training facilities, which may offer another solution to the problem without considering further annexation of the area by the City of Corpus Christi. When the wind resource area in northern California grew to more than 800 turbines in the mid-2000s, it created friction between Travis and the wind resource area (WRA) developers. This lead to the creation of the 2009 Cooperative Research and Development Agreement (CRADA), which gave rise to the development of radar software enhancements to help mitigate the impact of the wind turbines on the Travis radar system. 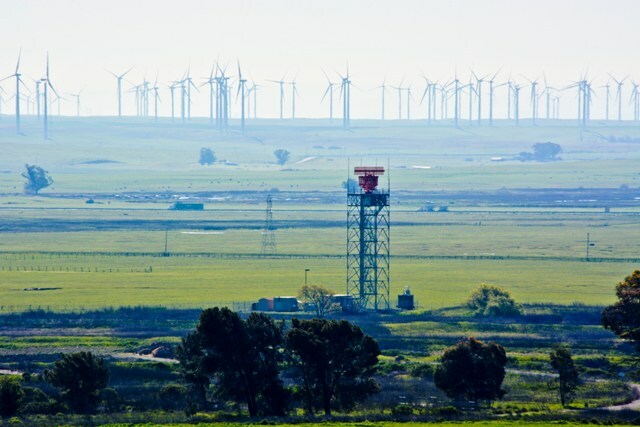 In what stakeholders considered a positive step forward to increase the production of wind-driven electrical power next to Travis Air Force base, the Air Force, wind energy developers, and local Solano County government officials came together to solve problems associated with the effects of wind turbines on air traffic control radars. “We are the only base that has turbines less than five nautical miles from the airfield,” said 60th Operations Group deputy commander Gary Gottschall. “The Wind Resource Area has more than 600 turbines that are more than 400 feet tall with blade tips that travel at more than 200 miles per hour and show up on radar as possible aircraft.” Gottschall further explained that many of civil aircraft are either not transponder equipped or choose not to turn on their transponders and therefore show up on the RAPCON scope in the same way a wind turbine appears. The final report, UNITED STATES TRANSPORTATION COMMAND COOPERATIVE RESEARCH AND DEVELOPMENT AGREEMENT: “Assessment of Wind Farm Construction on Radar Performance” was sent to the Joint Technical Working Group on January 20, 2010. It is important to note the airspace over the WRA is complex. The radar downwind pattern and tactical arrivals into Travis AFB extend over the WRA at 2-4000 ft MSL (mean sea level) and above. Air traffic controllers at Travis AFB provide service to aircraft flying in and out of Buchanan Field, located in Concord, and Rio Vista Municipal Airport. Due to its convenient location with no air traffic control interference, the airspace over the WRA is used by student pilots off Buchanan Field and Rio Vista for basic VFR (visual flight rules) training maneuvers. Also, IFR (instrument flight rules) traffic between the Sacramento and Oakland VORTACs (VHF Omnidirectional Range/Tactical Aircraft Control) fly through the center of the WRA on Victor-6 as low as 2000 ft MSL. Most importantly, VFR aircraft not equipped with transponders and looking to circumnavigate San Francisco’s 30 nm Mode C Veil frequently transition through the area. These aircraft funnel through the corridor above the WRA (Oakey Gate) and are a primary concern of air traffic controllers working traffic through the WRA. The use of Track Eligibility coupled with existing STARS (Standard Terminal Automation Replacement Systems) tracking algorithms was able to eliminate false targets even during significant wind activity over the WRA. Leaders from the 60th Air Mobility Wing, 60th Operations Group and 60th Operation Support Squadron met with members of the Federal Aviation Administration and C-Speed, a product development and engineering services company, at Travis Air Force Base on March 6, 2015, to discuss the progress of the new Cooperative Research and Development Agreement (CRADA) established in 2014 and initiated on January 15, 2015, to test the gap-filler, Light-Wave Radar System (LWRS). The system operates at a different frequency range than the current Digital Airport Surveillance Radar with a goal of being able to distinguish wind turbines from aircraft using a system that can fill in the gaps to pinpoint the difference. According to Airman 1st Class Amber Carter of the TRAVIS AFB NEWS, testing of the LWRS ran for approximately 90 days. “The ultimate goals were to eliminate wind turbine radar interference, increase the probability of detection, eliminate anomalies and integrate effectively into other radar systems. Travis is the first AMC installation to test such technologies and is paving the way for future radar improvements across the Air Force and the Department of Defense,” the article states.